It’s hard to believe that it’s been three whole years since I was a new grad nurse. What’s even more amazing is how much I have learned & grown as a nurse in what is really a very short amount of time. I’d never have believed it if you’d told me I’d be a charge nurse or a preceptor starting at age 24! There are several new grad nurses on my unit at work right now, & I also have several friends who are currently in nursing school, so I’ve been meaning to write a post like this for quite some time. For one reason or another I have never gotten around to it, but tonight I feel motivated to give it a shot. Please don’t think I’m identifying myself as some nursing expert or genius, but I do think I’ve gained a certain amount of wisdom over the past three years that’s worth sharing. Here goes. 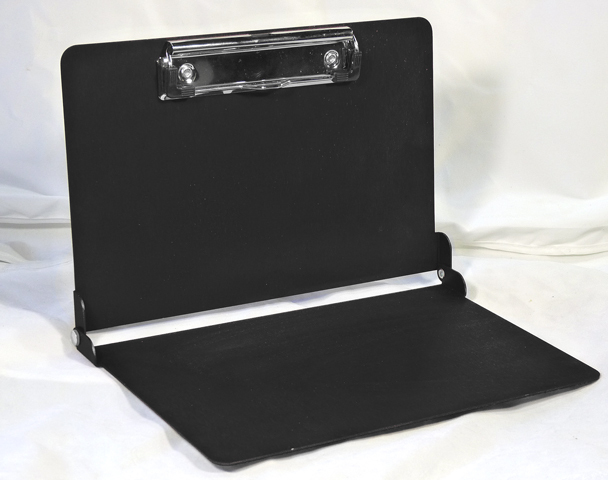 To extrapolate on that topic, invest in a good clipboard, the kind that you can store papers in. You can get them at Wal-Mart for about $8. 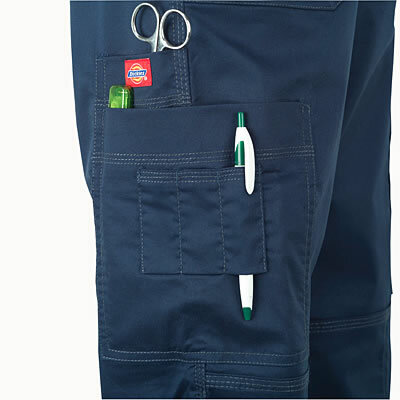 These things are genius because you can use them to store hospital policies, blank copies of your report sheet, & other such things that you want to have handy at all times but that you couldn’t possibly fold up & store in your pocket every shift. Don’t rely too much on information you receive in report. I’m by no means implying that you shouldn’t trust your coworkers, but I just know how hard this job is. I know how easy it is to miss a lab value or to get one patient confused with the next. ALWAYS take the time to verify orders in the computer (or God forbid the old-fashioned & horribly antiquated paper chart), research your patients’ lab values & test results, & read the doctor’s notes as much as possible. Remember that if you’re ever involved in a court case, saying “Well, the day shift nurse told me such & such in report” is not going to cover you. 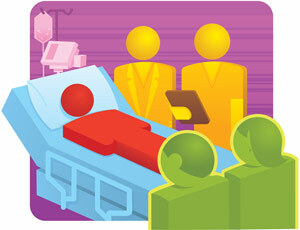 For example, if you’re giving blood, double-check that the patient has signed a consent form. If you’re giving multiple IV medications at once, double-check that they’re all compatible. Don’t just assume that if the last nurse gave them together it must be ok. Really look at your IV & central line dressings & make sure they are dated appropriately. 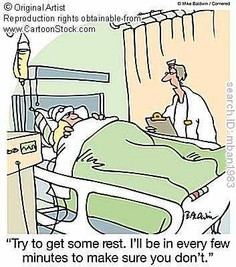 Read over ALL the orders on the patient’s chart. What I’m saying is it’s really easy to miss stuff & we all have to hold ourselves & each other accountable. GO BACK TO THE SOURCE. Read the orders. 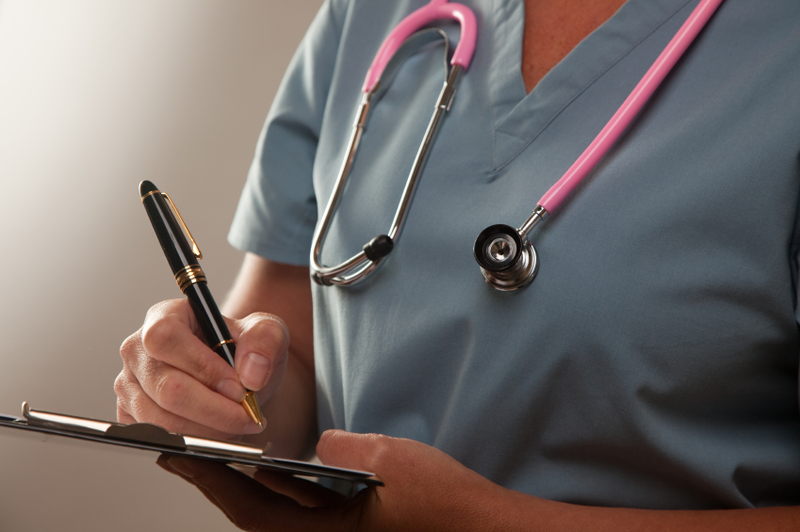 If you’re uncertain, ask another nurse for help, then call the doctor for clarification. On that subject, before you page a doctor, have all of the information gathered that you might need. Get a set of vital signs, familiarize yourself with the patient’s medical history & test results, & try to have a plan in mind of what you want the doctor to order (SBAR really is brilliant, y’all). If you don’t know what you should be asking for, consult another nurse. As a new grad, sometimes it’s hard to know what to expect because you are new & inexperienced, but the more experienced nurses around you should be happy to help you (I know I always am). Find a routine. 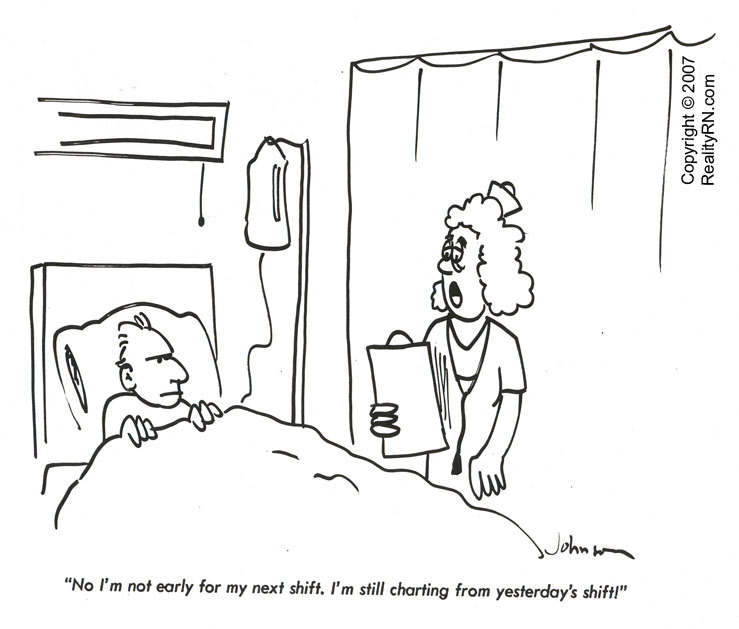 I know this can be so challenging because every shift can be so different. One of the hardest things about nursing is finding a balance between having a routine that keeps you sane & “on schedule” & having to be flexible & adapt that routine to the differing circumstances you face each shift. 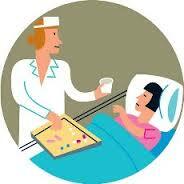 Every nurse’s routine will be different & that is ok. It’s all about finding what works for YOU. Yes, this will take some time. But really make an effort to analyze how your day went at the end of each shift. Over time you will identify trends of what made one day better than the next. Just as an example, I have detailed my basic routine below. Obviously I have to shuffle things a bit sometimes based on various circumstances that occur during my shift, but in general this is the routine I try to follow because I have found it works best for me. After clocking in, I stock my pockets with all of the items I mentioned in point number three above. Then I look up my patients in the computer & start outlining my report sheets with as much information as I can. This allows me to know what questions to ask in report. If I go into report blindly, it’s harder to anticipate what questions I need to ask. I don’t always have time to look up everything I’d like, but even a little information is better than none. Get report. I like to log into the computer in the room during bedside report so I can double-check orders, meds, etc with the previous nurse. If the patient has a major wound/incision, a central line, a PCA, etc, I double-check that with the previous nurse during report. If your hospital doesn’t participate in bedside report, I encourage you to do some research & suggest it to your manager. A lot of nurses aren’t fond of bedside report, but I love it. Here is why: It gives me a chance to meet my patients before actually doing their assessment & to ask them if there is anything I can bring for them when I come back to do their assessment. I can then write down those requests & be more prepared when I next enter the room (in other words, it saves me time in the long run). Furthermore it’s a huge safety measure that protects both patients & nurses. And additionally if anything crazy happens during the first hour or two of my shift, I never have to worry that I haven’t even laid eyes on some of my patients yet because I’ve already at least seen them during bedside report. 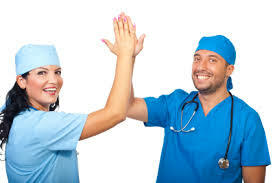 As a new grad nurse in a facility that did not (at the time) participate in bedside report, one of my greatest anxieties was knowing that if anything slowed me down in the first hour or two of my shift, there were patients I literally hadn’t even seen yet (& there was no way I could guarantee when the last nurse had seen them either). I no longer have that anxiety . . . Ok, I apologize for the tangent. After report, I get back on the computer & finish looking up lab/test results, orders, doctor’s notes (from the current day), & anything else that I feel is particularly relevant for my patients’ care. The only time I break this part of my routine is if I have a patient with a particularly urgent need. Even then I make time to do this as soon as that urgent need has been addressed. Yes, I do have a few OCD tendencies, but I really do think it’s important to have as much background on your patients as you can. Next I start on assessments & meds. As a new grad I usually tried to do all my assessments first & then do meds. Eventually I realized this was taking me way too long & patients sometimes got annoyed if their 2100 meds weren’t given till 2200 or later (usually because they wanted to go to sleep earlier & didn’t want to be woken up for meds). 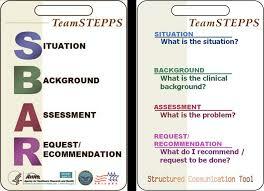 Nowadays I try to combine meds & assessments, usually starting with the “easiest” patients first (i.e. those with the fewest meds, those who are “walkie-talkies” & less likely to need 30 minutes of care in addition to everything else). By starting with the easier patients, I can then devote more time to my more time-consuming patients without worrying that I’m late to see everyone else. If you have a patient whose meds all have to be crushed or who is confused & likely to fight taking their pills, if at all possible, save them for last. Exception being if they have some kind of truly urgent need of course, but that should go without saying. It should also probably go without saying, but 99% of the time you can & should group your 8 & 9 o’clock meds, etc. Just know what your hospital’s protocol is in regard to this. Chart as you go as much as possible. At the very beginning, this might not be possible because you might not yet be familiar with your hospital’s charting system. But over time this is really one of the best ways to manage your time efficiently. At the very minimum I try to chart safety checks, pain & IV assessments, & any relevant I&O since those things can all be charted relatively quickly anyway. Then when I go back to finish up my charting later, all I have to do is add in my head-to-toe assessment, care plan, & patient education. If I don’t have time to chart the head-to-toe assessment in the room, I’ll jot down notes & the time so I can remember it later. After I finish meds, assessments, & at least a little documenting, I’ll round on all of my patients again to ask about evening snacks, toileting, etc. At midnight (or noon, if you’re day shift) the cycle starts again at # 5 above. Get to know your fellow nurses, both as nurses & as human beings. 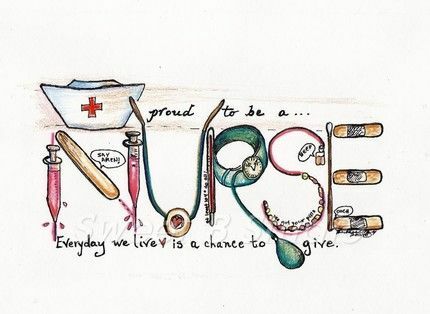 I know I wouldn’t be the nurse I am today without the guidance, coaching, & support of so many great nurses with whom I’ve had the privilege of working over the past few years. Nursing is absolutely a team effort & knowing you’ve got people to support you will go a long way in making your first year as a nurse more rewarding & less stressful. On a similar note, build a good relationship with your NAs because your NAs will make you or break you. Show them that you’re committed to the unit & your patients by chipping in with vital signs & toileting when you can. I’m not saying you shouldn’t ask them for help, especially when you’re feeling overwhelmed, but don’t be that nurse who leaves the room to find an NA to take the patient to the bathroom just because you don’t feel like doing it. That is unacceptable (unless of course you have a true emergency with another patient). A good NA is worth her weight in gold. When you have one, show them how much you appreciate them. I’m a much better nurse when I have good NAs to help me & I always strive to make sure they know that. Remember, we’re all in this together. When you’re scared to try something, do it anyway; just find someone to help you. I was never one of those nursing students who was dying to learn to start IVs. In fact I was terrified by the idea. Unlike some, I didn’t become a nurse because I wanted to stick needles in people. I really didn’t. It took me a solid six months as a nurse to really get a handle on starting IVs because I was just so freaked out about it. I would get so nervous that I was practically paralyzed with fear. But I am so thankful for a few nurses who really took the time to help me, to even push me into rooms to start IVs, even when I really didn’t want to, because guess what: eventually I got it. And after a few more months, I actually became pretty good at it. Not great perhaps, but good enough that people occasionally asked me to try an IV for them. Sometimes you will fail over & over again, but every time you fail you still learn something. And it truly is all in your head. 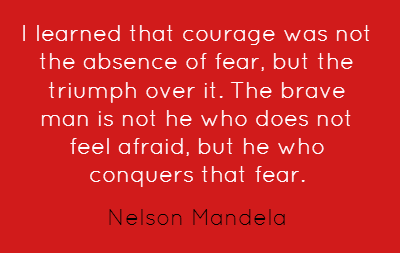 Once you master the fear, you will be amazed at how quickly your skills improve. On the same subject, don’t obsess too much about your hands-on skills. You will master them with time. Focus on time management & critical thinking because at the end of the day these things are what will really make you or break you as a nurse. I’ve said it before & I’ll say it again: as a nurse your must important tool is not your hands; it’s your brain. Use it!! Don’t beat yourself up for not being perfect. No one is ever perfect. We’re all still learning, & that is part of what makes nursing so much fun. And we all have days when we feel like we’re just barely keeping our head above the water. It happens to the best of us. It’s very easy to get burnt out in nursing between demanding patients (& family members) & unsympathetic/unrealistic upper management, not to mention the sickness & death we see on a regular basis. Realize you will have times when you are not the angel of kindness you always dreamt of being. Just be aware of it so you can temper it & not become a bitter, angry soul. Go out with your nursing buddies & vent about your frustrations. They really are the only ones who can truly understand what you’re going through. Additionally, find outlets away from nursing that allow you to relax & rejuvenate. For me that means listening to music, playing my flute, hiking, reading, & above all, writing. It doesn’t matter what your outlet is, as long as it contributes positively to your mental health. If you’re working night shift, realize it does get easier with time. I DREADED night shift. I cannot tell you how paralyzed with fear I was about it because I have NEVER been a night owl. Even in college, I never once stayed up all night. But guess what: three years later I now love night shift (for a variety of reasons which you can read about here: https://athicketofmusingsblog.com/2014/06/06/10-reasons-why-night-shift-rocks/). Everyone has to find what works for them in regards to adjusting to night shift life, but for me I’ve found that working three nights in a row is helpful so that I can have a more “normal” life on my days off. Also black-out curtains are a MUST. The Eclipse brand sold at Wal-Mart or on Amazon are fabulous. 12. Perhaps the most important advice I can offer is also the simplest: ASK QUESTIONS. If something doesn’t feel right, speak up. Do not be afraid of “looking stupid” or “bothering” other nurses or even doctors. Mistakes happen when people DON’T ask questions. If you’re a new grad nurse or a nursing student who can’t wait to graduate, I hope you’ve found this post helpful. Your first year as a nurse will be incredibly challenging & incredibly difficult at times, but please believe me when I say it really does get better & easier with time. Take a deep breath, listen to some Five Finger Death Punch or Godsmack to get you all fired up, & go out there & be the rock star nurse you know you were meant to be! If you’re an experienced nurse & would like to chip in with your ideas, please comment below. I’d love to hear from you. As I said, I’m always learning too. Cheers! You’re so welcome! I’m so glad it was helpful to you. I do not have a poker face at all either. I have been in similar situations as well. I promise it does get easier with time!